So... I've had a bit of an unplanned blogging hiatus! 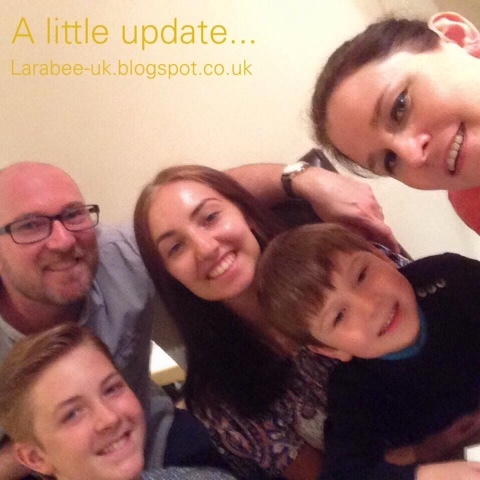 Whilst I haven't been writing many actual blog posts I have been busy working 'behind the scenes' on LarabeeUK projects which I'll tell you more about in another post but for today I thought I'd give you a quick update on what's going on round here. Firstly I got a bit of a strop on with blogging and just got myself in a bit of a funk, with the help of some wonderful blogging pals I got out of it and realised I was just being very silly. The problem was, it made me not enjoy the process, but now after a little break I'm hoping to be back with a vengeance. Then, just as this was happening, I was offered a fantastic promotion at work, I've already started and it is pretty intense but I'm loving it and I am going to be taking 2 qualifications and many many courses but I needed change at work and by goodness do I have that now. How it will affect my blogging longer term, I just don't know but I'm hoping I'll be able to keep all the balls in the air, even if it means posting less. T shocked us at the end of July by deciding that he no longer wanted a 'baby bottle' to go to bed! This has been something that played on my mind for quite some time as at 3 1/2 he was already a good 2 years beyond when I wanted to get rid of it, I couldn't really see and end in sight but knew that we had to get rid before he started school. Thankfully him stopping wearing pull ups at night (about a week before!) made him want to be a big boy and so all of his bottles went in the bin. There has been a slight downside to this though, for 3 1/2 years T has used a bottle to settle to sleep, so he's really been struggling at bedtime. Our old routine has gone out of the window and we're now working on a new one. He has stopped crying now thankfully, that really was the worst thing, the poor little mite got so tired and frustrated he just cried and cried, even though I was cuddling him or with him, he still was inconsolable. After tests, The Hubs has been diagnosed with a hole in the heart, which was highly likely to be the reason for his TIA. Whilst this is great news in that he now has a reason why it happened, he is now going through tests to determine the treatment of this condition to try and reduce the risk of further attacks or a more serious stroke. We're hoping that his tests will be done within the next few weeks so we know what's going on. Kelsey did really well on her GCSE's she got everything she needed to stay on at her school to study her A-Levels, so we're really proud, she's now has to knuckle down to get the grades she needs to study her desired course at Bath Uni. The Teens went to Florida and Mexico on holiday for a couple of weeks and Hayden goes back into year 10 next week starting his GCSE's. So as you can see it's been quite an eventful few weeks!